The Superintendent's Student Advisory Council is made up of students in grades 11-12 that meet with Superintendent Dr. Bobby Ott twice a semester and provide feedback from a student's perspective about the state of Temple ISD. The council is comprised of 25 students selected annually through an application process that occurs in May. 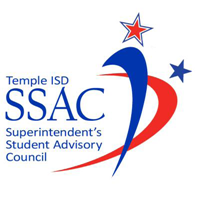 If you will be a Junior or Senior at Temple High School next year and are interested in participating in the Superintendent's Student Advisory Council, click on the form below to begin the application process.